Music dominated King’s Week and there were two Symphony Concerts. 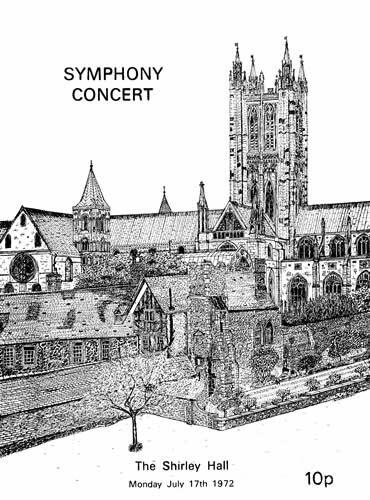 The first comprised Berlioz’s Roman Carnival Overture, Beethoven’s 4th Piano Concerto with Stephen Harrison as soloist, and Dvorak’s 4th Symphony. In the second, violin teacher and orchestra leader Clarence Myerscough was the soloist in Sibelius’s Violin Concerto. Many of the Symphony Orchestra have gone on to distinguished musical careers, including Stephen Barlow (percussion), Harry Christophers (clarinet), Quentin Poole (oboe), and Patrick Williams, Paul Edmund Davies and Jonathan Seers (flutes). The programme covers for the year (illustrated here) were drawn by Barnaby Wheeler. He also played the violin in the Symphony Orchestra, and went on to become an architect. The nationally renowned King’s Singers were a very popular draw. Simon Carrington OKS reappeared in King’s Week fifteen years after his debut as a treble in the Serenade, but Martin Lane OKS had by now left the group. The Singers paid a second visit in 1976. Other events included Shakespeare’s Richard II in the Deanery Garden, Anouilh’s The Lark in the Water Tower Garden, the Serenade in the Cloisters, a Concert of Light Music in the Headmaster’s Garden, and a Physical Education Display on the Green Court. There was also an Exhibition of Prints and Drawings of the School mounted by the newly established Archives.